I saw Sylvain Chomet's The Illusionist at the Ottawa International Animation Festival. I found it so remarkable that I returned to see it again the following night. The review below is an attempt to convey my feelings about the film without revealing too much of the story, as it has yet to be released in North America. There are many aspects of this film that I will eventually discuss in great detail, but that will have to wait until other people have the chance to see it. The film is scheduled to open in New York and Los Angeles on Christmas Day and I assume it will get a wider release early next year. Sylvain Chomet's subject is human eccentricity. That was plain in his earlier work, The Old Lady and the Pigeons and The Triplettes of Belleville, though he hadn't found a way to combine his eccentrics with a workable story. 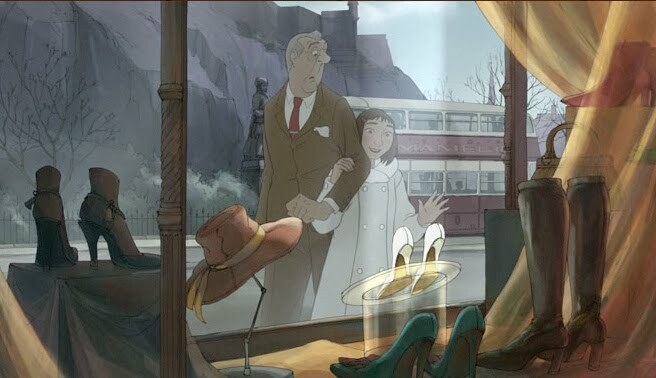 The Illusionist, based on a script by the late French comedian and filmmaker Jacques Tati, is Chomet's best film yet, one that combines his eccentrics with a melancholy tale of age and youth. Tati's script was written sometime in the latter 1950's, and this film has strong echoes of Chaplin's Limelight. Both films concern performers who have lost their audience and who have encounters with younger women. Limelight pairs Chaplin with a depressed ballerina. While his own career deteriorates, he helps to revive hers. In this film, Tatischeff, a stage magician, becomes the protector of Alice, a teenage maid who attaches herself to him to escape her life of drudgery. At best, Alice is naive; she takes Tatisheff's magic as real. He works hard to fulfill her wishes. However, this puts financial pressure on Tatischeff, whose act is passé, and eventually he can no longer sustain her illusions. What separates this film from most contemporary animated features is its acknowledgment of failure and its feeling of melancholy. Tatischeff is only one of several performers who are watching the demand for their talents vanish in the age of television and rock and roll. There is a ventriloquist, a clown, some acrobats and an opera singer, all of whom are remarkably individual in their appearance and movements. Chomet gets to indulge himself with them, but in a broader context that ties their oddness to being out of step with audiences. As this film is made with drawings in an age of cgi, I wonder if Chomet wasn't reflecting on his own situation as his animated performers became more desperate. Live action is full of autumnal films. Limelight, John Ford's The Man Who Shot Liberty Valance, and John Huston's The Dead are suffused with sadness and a feeling of helplessness. 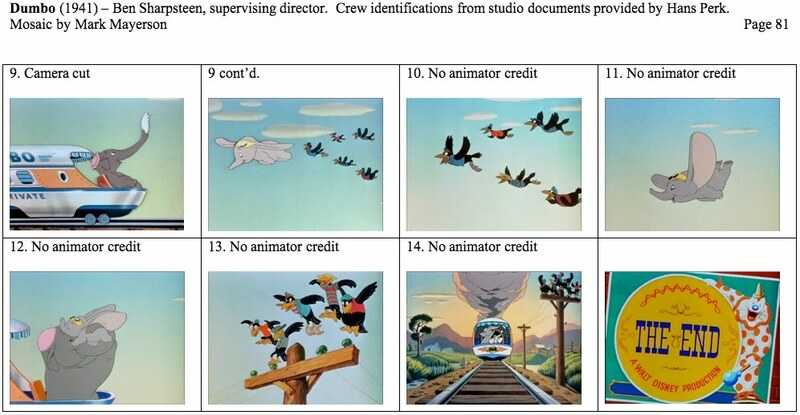 Until now, animation has refused to acknowledge these things. As animation directors age, they don't mature or else the industry doesn't let them. Chomet is not yet 50, but he has directed this film with the wisdom and insight of someone twenty years older. Some films become touchstones; they remain part of the conversation years after their release. For some part of the animation community, The Illusionist will be a touchstone. While I have enjoyed Toy Story 3 and How to Train Your Dragon, The Illusionist is my favorite animated feature of the year and I don't expect that will change in the remaining months. The National Film Board of Canada will host an animation open house at its Montreal office on Monday, October 25. You can find details here. 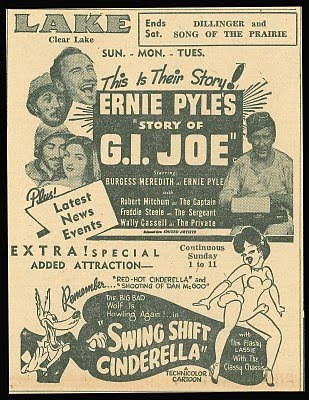 Over at Greenbriar Picture Shows, John McElwee posts part one of a two part series on how theatre owners advertised animated shorts to attract customers. And here's part two. 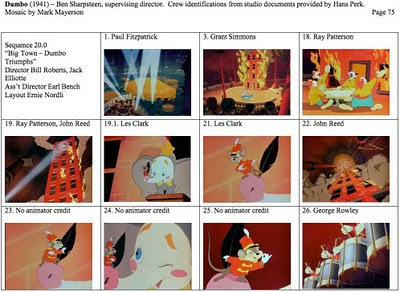 Steven Hartley has started to post a mosaic of the "Pecos Bill" sequence from Melody Time, based on documents provided by Hans Perk. I'll be at the Ottawa Fest from Friday to Sunday. For the occasion, I've put my photo up on the blog. If you see me there, stop and say hello. This sequence shows the aftermath of Dumbo's flying. The montage is a great snapshot of the public's preoccupations at the end of the 1930's. Dumbo setting an altitude record relates to the public's ongoing romance with aviation at the time. People like Charles Lindbergh, Amelia Earhart, and Wiley Post were all celebrated aviators of the period (the latter two dying in flight). "Dumbombers for defense" relates to the war in Europe, which the United States would join in 1941. The Hollywood contract had been sign of success at least since the 1910s, when performers started to make big money and in the '30s, movies and radio were the two major mass media. 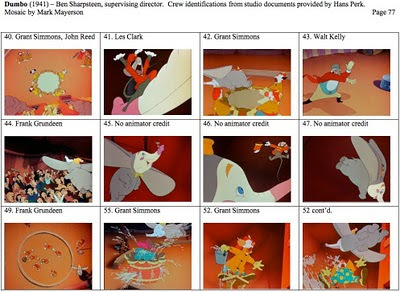 Dumbo's contract also explains Timothy's absence from the final scenes. What follows the montage is the transformation of the circus. There have previously been scenes of Casey, Jr. in dark and stormy weather. He's now bedecked with flowers and chugging effortlessly in the bright sunlight. The elephant gossips are all smiles and celebrating the one they formerly ostracized. Dumbo's mother has gone from her depressing prison to a luxury car and now nothing stands in the way of her physical contact with her child. The crows have the vicarious pleasure of an outcast triumphing with their help. The few animators credited here are effects animators, so we're completely without credits for the character animators. 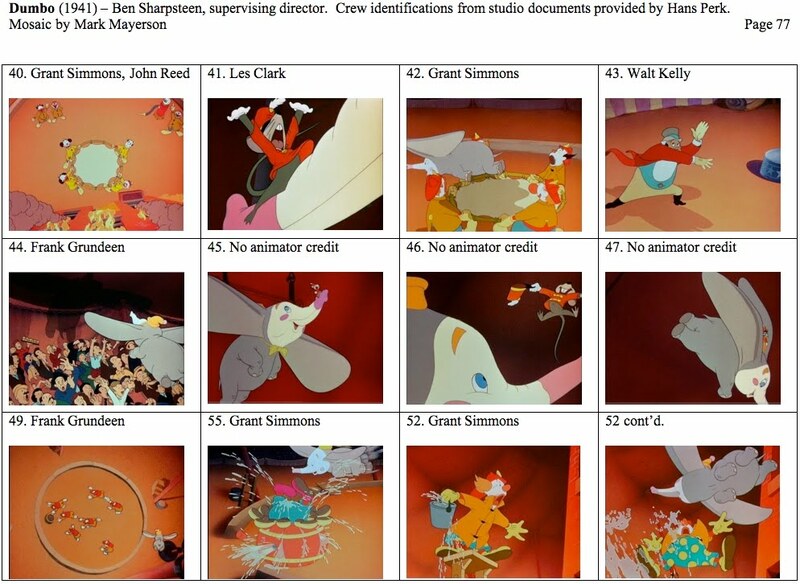 Dumbo's bath sequence isn't critical to the plot; it can be removed without changing the story. But it is crucial emotionally, as it is the only time we see Dumbo after his ears are revealed when he's not under attack of some sort. As a character, Dumbo is pretty much a cipher except for this sequence. There's nothing particularly individual about the way he panics when separated from his mother or the way he is scared when the elephant pyramid falls or when the clowns push him from the building. If Walt had Roy, America had President Franklin D. Roosevelt. In 1940, he was running for a third term, a first in American history, and he had shepherded the country through the Great Depression. The feelings of helplessness in the face of larger forces and the need for a saviour were reflected in Dumbo. In a lot of ways, Disney and the zeitgeist separated in the post-war years. With America having won the war and become a world power, the idea of helplessness was only good for movies aimed at children. 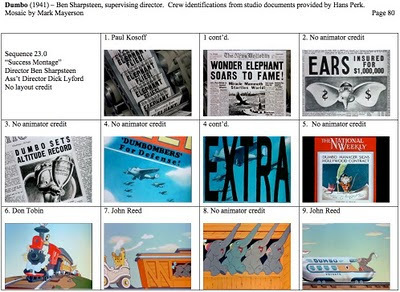 Films for adults became a lot more psychologically complex in the '50s and while there was still a lot to be afraid of (the burgeoning youth culture, the cold war and science run amok), the passivity of Disney's animated heroes was no longer mainstream. Even young Jim Hawkins gets to shoot somebody in Disney's live action Treasure Island. Dumbo was the only Disney feature set in contemporary times until 101 Dalmatians and the only film to address racial issues until The Princess and the Frog. Racial and ethnic stereotypes show up in films like Lady and the Tramp and The Aristocats, but there is no attempt to get beyond stereotypes. If anything, the Disney films shunned present-day problems and were set in the past or in fantasy, where problems were straightforward and solutions were cut off from real-life complexity. 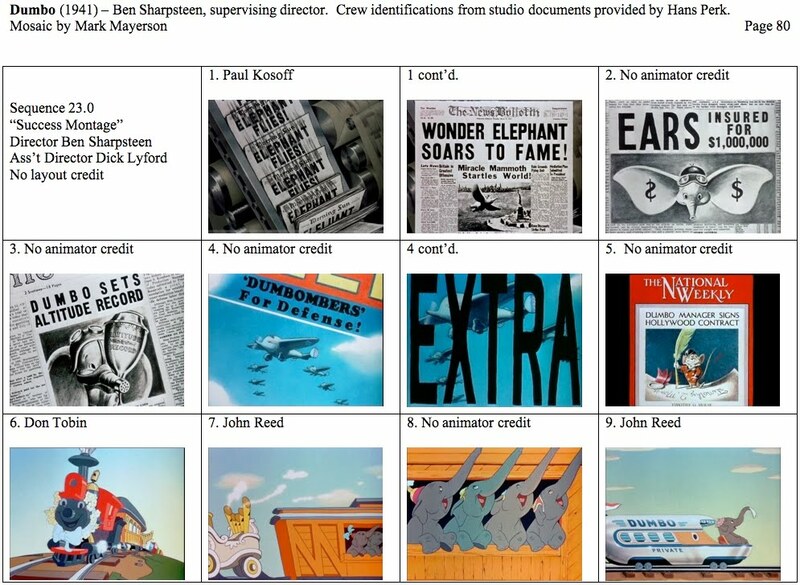 The world of 1940 leaks into Dumbo and it's one of the things that makes the film so interesting. In several ways, the film is a precursor to Ralph Bakshi's work and it's a shame that in the intervening 30 years, neither Disney or anyone else was willing to pursue contemporary issues in the form of an animated feature. Having completed this latest mosaic, I'd like to thank Hans Perk once again for the studio documents that make this (and the other) mosaics possible. I'd also like to thank everyone who took the time to comment. Deadline Hollywood Daily is reporting that Starz has sold Film Roman to "a group of investors lead by former Film Roman President Scott D. Greenberg." To the best of my knowledge, this is the fifth set of owners the studio has had since it was founded by Phil Roman. 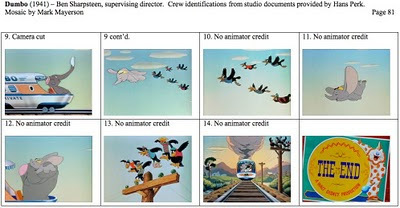 The studio is best known for The Simpsons, but it works on the show as a supplier. It doesn't own any part of the show. Starz' Toronto studio, which has produced features such as Everyone's Hero, 9 and Gnomeo and Juliet has been up for sale at least since last July. John Canemaker's latest article for Print is online, with a survey of the Irish animation scene. It includes embedded versions of two films by Brown Bag, Give Up Yer Aul Sins and Granny O'Grimm's Sleeping Beauty, as well as trailers for two Cartoon Saloon productions, The Secret of Kells and Song of the Sea. Run, don't walk, over to the ASIFA Hollywood Animation Archive, where they have a complete Jim Tyer storyboard for an unproduced Terrytoon called Blood is Thicker Than Water. The material includes the script and you can see how Tyer broke it down. Some of the drawings are in blue pencil and others are finished, such as the drawing above. The writer, whoever he was, clearly had Song of the South in mind. Two of the Uncle Remus stories are referenced here, the tar baby and the "born and bred in the briar patch" sequence. 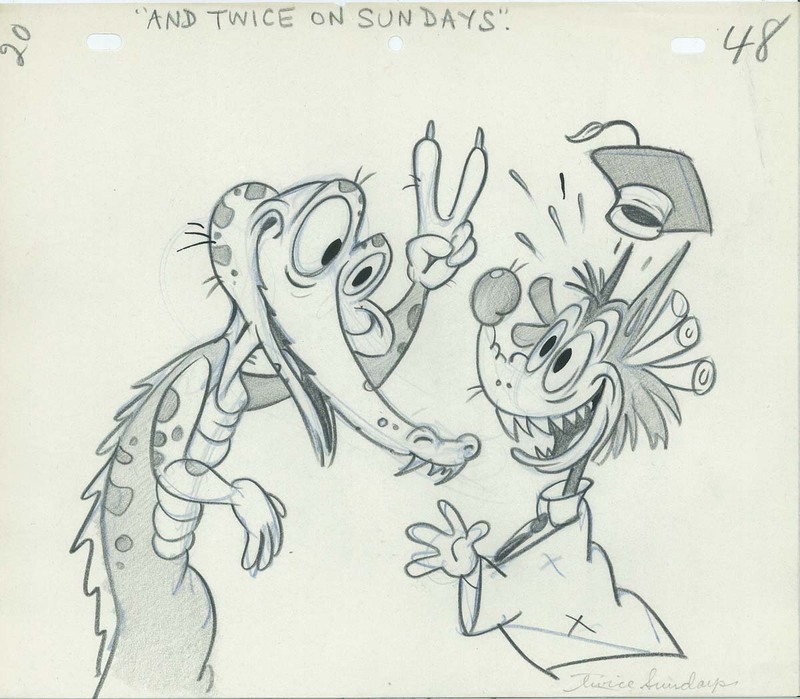 The ending of the Terrytoon is forced, but Tyer's great, cartoony drawings are so much fun to look at that they make up for the story the same way his animation saved the finished cartoons. 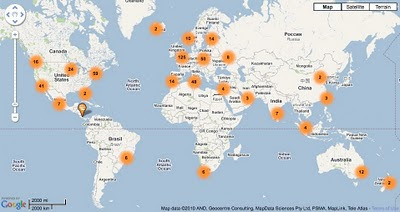 I've recently learned of two very interesting interactive maps. One locates computer animation studios and the other gaming studios. There may be an overlap between them. There are obvious benefits to these sites for anyone trying to find a job. However, not everyone realizes the repercussions of various locations until they've experienced them. I'm not talking about specific cities, but I am talking about studio density. Depending on where someone is in his or her career, density makes a big difference. The problem with low density locations (i.e. with just one or two studios) is that if you get laid off or a studio closes, you have to relocate in order to continue working in the industry. This is what happened to people in Arizona when Fox closed it's studio, to people in Florida when Disney closed there, and to people in Portland when Laika laid off the crew after Coraline. This isn't much of a problem for people who are unattached, but it becomes a much larger problem once people form romantic relationships and have children. Uprooting other people in pursuit of one's own career can create powerful resentments. As a result, people tend to flock to those areas with half a dozen or more studios, so that if they have to change jobs, they don't have to relocate. Of course, it means that people starting their careers often have an easier time finding work in the smaller centers as it is harder to entice people to move there. Regardless of where you might be in your career, these maps may prove useful. Today is Buster Keaton's birthday. That's him in old age next to a photo of himself as a child performer in vaudeville. 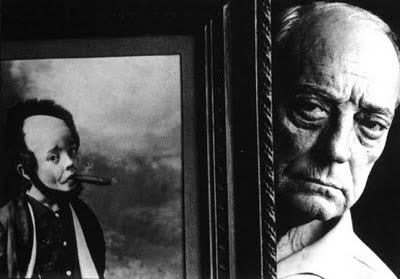 I recently read The Fall of Buster Keaton by Joseph Neibauer, about Keaton's career after he lost his creative independence in 1928. The book is a reasonable survey of his work at Educational, Columbia, MGM and in television, but it needed a stronger editorial hand. Quotes and phrases are repeated and the book often degenerates into summaries of the films. I'm am looking forward to reading Buster Keaton: The Persistence of Comedy by Imogen Sara Smith. The book got a very good review at Greenbriar Picture Shows. It's amazing that 115 years after his birth and more than 80 years after his best work, Keaton continues to fascinate. Finally, Dumbo triumphs and shows his worth. Note the large gap between shots 3 and 18. The missing shots that are on the draft are all of the clown fireman arriving and preparing to fight the fire. The Disney studio wisely decided not to delay Dumbo's triumph any more than necessary. Now that the audience knows Dumbo can fly, they are waiting to see the secret revealed and wonder how it will affect Dumbo's life. The idea of the magic feather is frankly hokey, but it serves an important storytelling purpose. It's a convenience for the film makers, as Dumbo should not believe in the feather as he didn't have it before waking up in the tree. It's more logical to believe that Dumbo's "magic feather" should be alcohol. However, because the audience knows Dumbo can fly, there would be no suspense in this sequence without some way to cast doubt on his eventual success. As Dumbo believes in the feather and he loses it during his descent, the audience is left guessing what will happen. The wind and siren sound effects during Dumbo's fall from the building are very effective in ramping up the suspense. 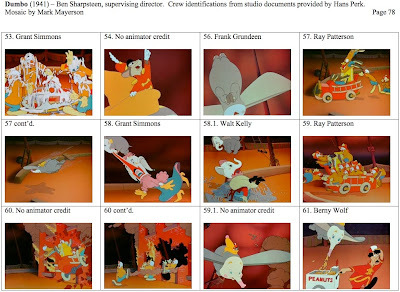 Note also the airplane sound effects when Dumbo pulls out of the dive. Logically, the sound makes no sense but it is emotionally right. Dumbo's shadow, which showed he could fly in the last sequence, is once again an important storytelling device as his shadow moves over the ringmaster and the crowd. It's a little surprising how much Dumbo goes after the clowns compared to the elephants. The clowns were insensitive and ignorant, but the elephants knew full well what they were doing. This sequence feels somewhat truncated. Once Dumbo takes his comic revenge on his tormentors, there's really nothing left for him to do. There's one more short sequence to wrap up a loose end, but the story is effectively over here. The layouts for camera moves in this sequence are very effective, both during the fall and after. The moves add to the sense of urgency during the fall and afterwards bolster the gracefulness of Dumbo's flight. The stand-out animation here is by Les Clark. 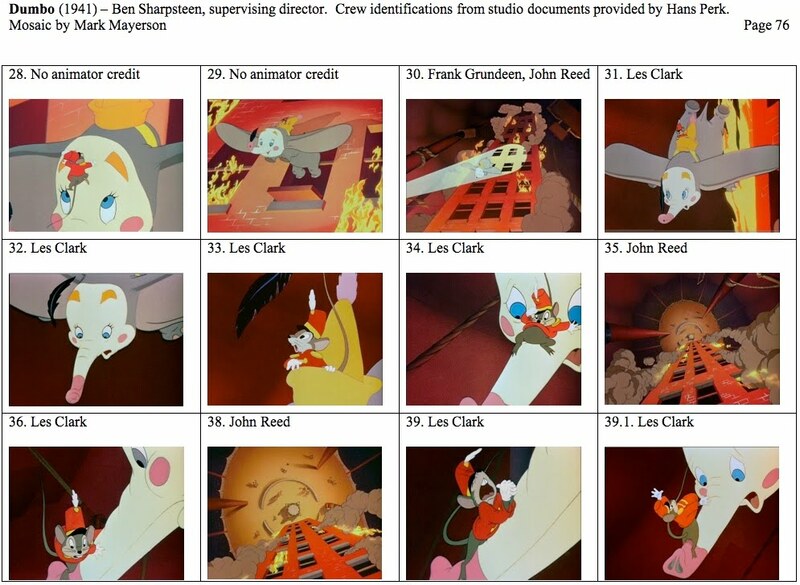 His work on Timothy during Dumbo's descent is excellent and it's a shame he doesn't have more footage in the film. Grant Simmons and Ray Patterson do the clowns here, though humour comes from the clowns' humiliation, not their planned antics. Walt Kelly returns for a couple of ringmaster shots. 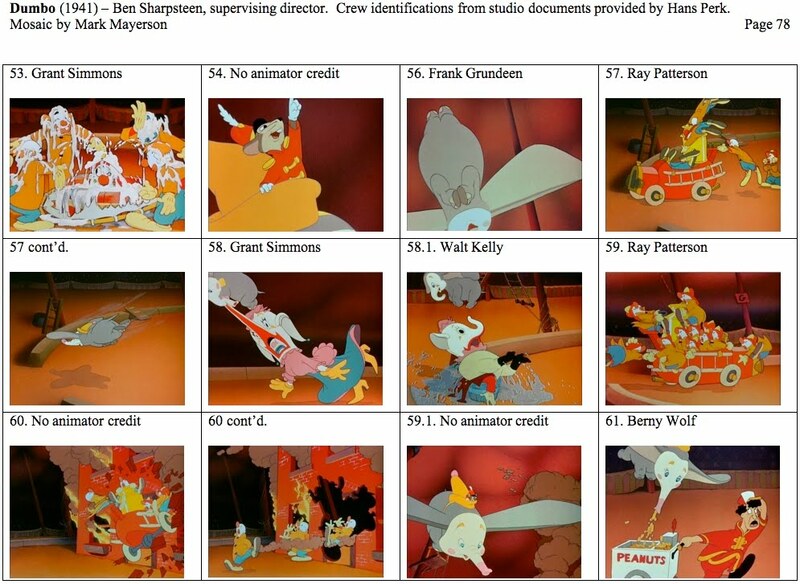 It's a shame that some of the shots are uncredited, especially Dumbo's machine gunning the peanuts at the elephants.